Elephants in Hwange. We were so close, I took this photo using my Blackberry phone camera! “Oh my god do you guys see that? Right over there?” I’m pointing furiously at the sight no further away than the length of a football field, separated from the hotel grounds by nothing more than a fire pit and a green manicured lawn, where dozens upon dozens of red dusty elephants in all sizes are frolicking in a muddy water hole. It is an exhilarating, magical feeling that has caught me completely off guard. It’s a sensation I quickly learn is not all that unique in Hwange National Park, home to the Presidential Herd of elephants. Estimated at some 40,000 strong, it is one of the largest herds anywhere in Africa. 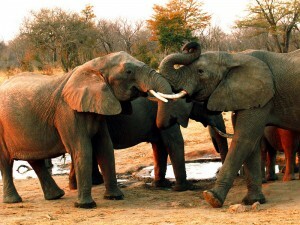 Ivory Lodge, which sits on a private 6,000-acre concession abutting Hwange (there are no fences separating the properties to prevent animals from wandering between the two), is located next to a popular pachyderm watering hole that regularly attracts up to a hundred of these gentle giants at once. In fact, over the course of the next 48 hours, I see and hear more elephants than I ever imagined. One of the best spots at Ivory to see elephants is its delightful “hide.” Located down a short path from the main lodge, the hide is set right at the edge of the water hole. Sitting there allows you to get so close to the elephants (and whoever else is having a drink that day) that they can touch you with a trunk should they choose — a juvenile male did this to me when I was in the hide alone at night, sipping on an Amurula. Zimbabwe’s largest national park is also one of Africa’s “big 10” in terms of landmass, covering an enormous 14,651 square kilometers. Its size becomes very obvious on the drive from Bulawayo to Victoria Falls, when you pass signs for the various park entrances that stretch along nearly 200km of road. (Ivory’s is at the extreme southern edge, closest to Bulawayo.) The park’s location close to a major highway is a serious plus — this is one of the most accessible parks on the continent and you won’t need a 4WD vehicle to access most of it. Staying at Ivory for instance, requires you to drive just 2km down a dirt road. Hwange is home to more than 400 species of bird and 107 species of animals. Besides the massive elephant populations, keep an eye out for all the big cats — cheetah, lion, leopard — who all call this place home. The dry season, between July and October, is best for wildlife viewing as thirsty animals will travel long distances to reach the some 60 waterholes or “pans” (many of which are artificially filled by park officials) and the bush is dry and dead (making viewing easier). 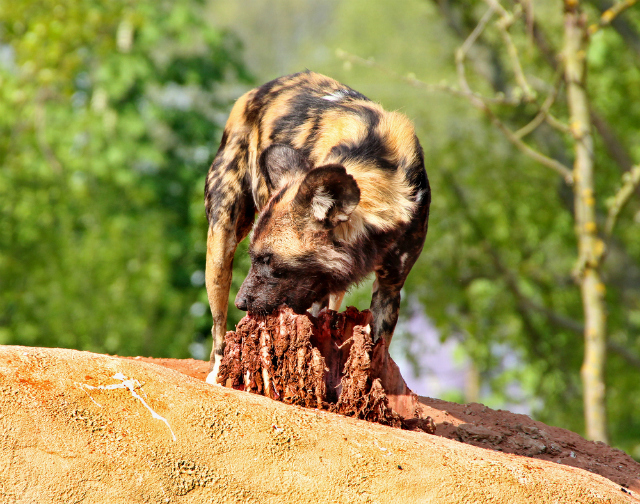 One of the most special animals to see on safari in Hwange is the painted dog. We got to see an entire pack hunting at dusk, which was quite the sight, with the dogs spreading out and calling to each other as they circled their prey. 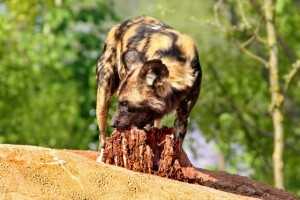 With less than 5,000 of these wild dogs remaining on the continent, they are highly endangered and Zimbabwe is one of their last great strongholds. If you have time, pay a visit to Painted Dog Conservation located near Hwange airport, just off the main road. It’s a rehabilitation facility for sick and injured dogs which aims to heal pups before they are returned to their packs in the wild. You can either stay inside or outside the park. One benefit of staying outside the park is that the lodges all sit on their own private estates, and animals roam freely between the lodge grounds and the park property. So you can go on game drives outside the actual park, and therefore avoid paying the $20 per person per day entry fee. Although the chance of seeing animals is usually greater in the park, so it is worth paying to enter at least once. Besides Ivory Lodge, outside-the-park sleeping options include the upmarket Hide, and the mid-range Hwange Safari Lodge. Both are on their own private concessions, and offer full board and activities options. Inside-the-park accommodations are more basic, but the three camps all have decent and affordable facilities. 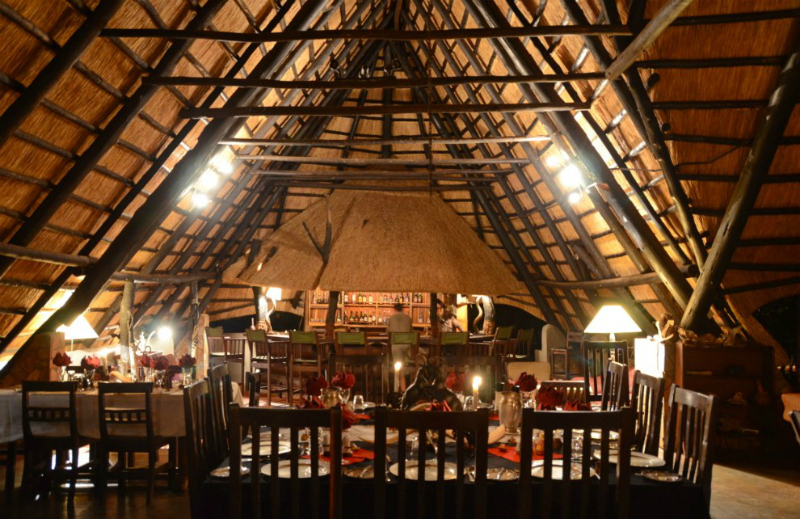 The largest and most accessible is the Hwange Main Camp, which is at the park entrance and offers basic budget-friendly digs in self-catering chalets, cottages and lodge rooms, plus camping options. There is a restaurant, a grocery store, and you can arrange for organized walking and driving safaris. The other two national park camps, Sinamatella and Robbins Camp, also offer decent digs in more remote locales. This article originally appeared on AFKTravel. Want to discover the finer side of Africa? Sign up for the weekly newsletter.